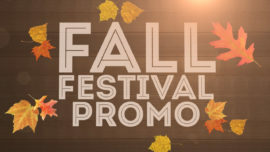 Promote your church's Fall Festival event with one of these promotional videos. 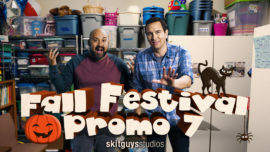 Promote your Fall Festival with this video from The Skit Guys. When you buy this video you receive 3 different versions to best fit your need: - Video with titles that says "Join us for our Fall Festival". - Video that has a blank space that you can edit and drop your own title in. This requires some video production know how. - Video with no titles at all. The Skit Guys team up with Jim Birdsall, the voice of NFL Films, to help you advertise your Fall outreach event! In addition to the promo video, this package also includes a BONUS Volunteer Video to help you recruit workers for your event! Also, you’ll get both videos with 3 different endings: generic (as seen in the video preview), no text, and an editable text box ending. That’s SIX videos in total! Ding Dong! The Sanders are back to show your Church how NOT to invite friends and neighbors to your Church’s Fall Festival. Use this humorous video to get the word out about your Fall Festival or Trunk-or-Treat. This download includes 3 different customizable options to suit your Church’s needs. 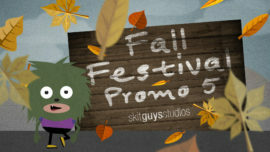 Looking for a fun way to tell your church about your fall festival this year? Let the great people at The Church Carnival Research Institute help you out. This pack comes with 3 videos for you to use. Also includes an AfterEffects project file if you would like to make a custom ending. 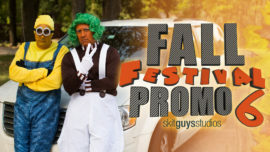 While it might be illegal for giant twinkies to operate motor vehicles, what's not illegal is using this humorous video to get the word out about your church's Fall Festival or Trunk-or-Treat event. This purchase includes two alternate endings to suit your church's needs. 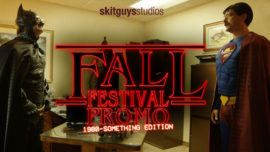 Whether you call it a Fall Festival, Trunk or Treat, or even a Holy Ghost Weenie Roast the two dads in this rad video (discovered in our 1980’s Skit Guys time capsule) are a little excited about all the fun that awaits! Perfect to promote your church’s activities this fall. Use this fun and upbeat video to promote your Fall Festival, Harvest Celebration, or Halloween alternative. Its contemporary autumn design will help you grab the attention of children and young families. 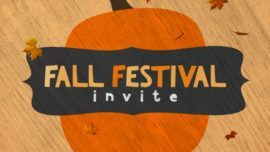 Encourage your members to invite their friends and family to your church's Fall Festival Event. Use this cute and fun mini-movie to promote your upcoming fall festival, and remind your congregation to invite a friend or two!